Sunday August 25th 1901 I got the work done up and read some before noon I wrote some and took a nap in the afternoon. There was a look of rain today but it did not come. 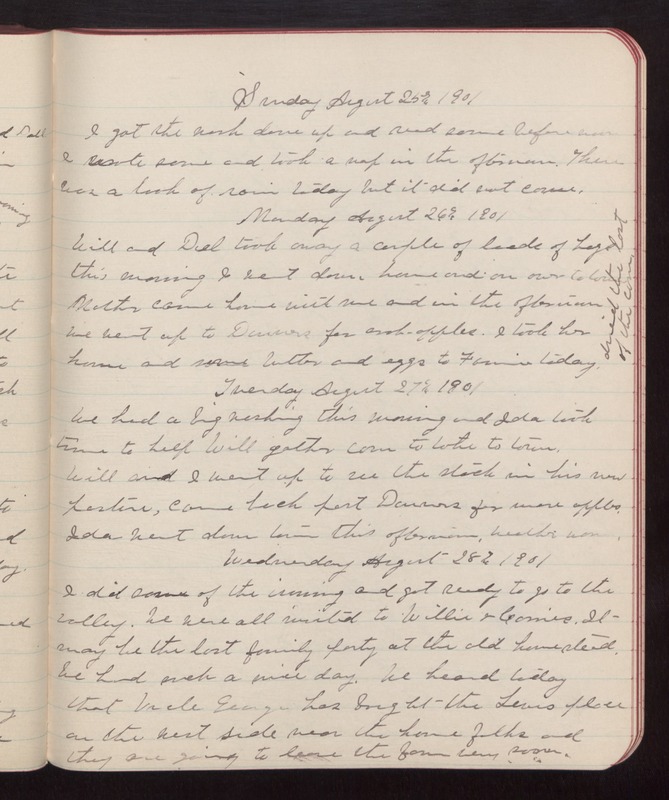 Monday August 26th 1901 Will and Del took away a couple of loads of hogs this morning I went down home and on over to town Mother came home with me and in the afternoon we went up to Danvers for crab-apples. I took her home and some butter and eggs to Fannie today. dried the last of the corn. Tuesday August 27th 1901 We had a big washing this morning and Ida took time to help Will gather corn to take to town. Will and I went up to see the stock in his new pasture, came back past Danvers for more apples. Ida went down town this afternoon. Weather warm. Wednesday August 28th 1901 I did some of the ironing and got ready to go to the valley. We were all invited to Willie & Connies. It may be the last family party at the old homestead. We had such a nice day. We heard today that Uncle George has bought the Lewis place on the west side near the home folks and they are going to leave the farm very soon.